A very new addition to Slydale Hollow, they bring with them a necessary service to the valley, a bus! Now when the residents want to travel to the larger towns & city they don't need to hire a car or organise a ride with someone else. 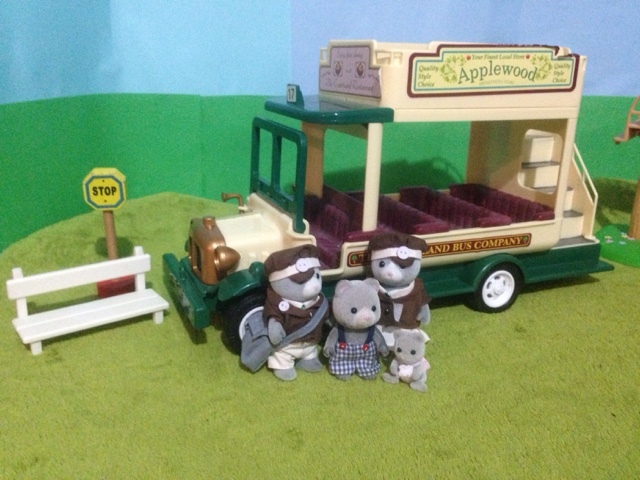 Also Mayor Timbertop has high hopes that the new bus service will bring visitors to appreciate the quiet of the Hollow. Owen, son & cheeky, active boy who thinks travel around Sylvania on a bus is the best life! Baby Olivia, who loves sitting up front between her Dad & Mum, & watching the world go by. I love that bus!!! A great addition to your village. You're lucky the Bearburys came to your village! I'm sure all the residents are happy to have a bus to travel.